Huế (化 in chữ Nôm), the capital city of Thừa Thiên-Huế province, Vietnam, had been the imperial capital of the Nguyễn Dynasty between 1802 and 1945. Located in central Vietnam on the banks of the Sông Hương (Hương River), the city sits just a few miles inland from the Biển Đông. It lies about 700 kilometers (438 miles) south of the national capital of Hanoi and about 1100 kilometers (690 miles) north of Hồ Chí Minh City, the country's largest city formerly known as Saigon. Renowned for its historical monuments and imperial architecture, UNESCO designated Huế a World Heritage Site in 1993. Chinese Neo-Confucianism had become a powerful influence in Vietnam from the fifteenth century during the reign of Le Thanh Thong, one of the Nguyễn Lords. Hué served as the capital of the Nguyễn Lords, a dynasty that ruled most of southern Vietnam from the seventeenth century to the nineteenth century. 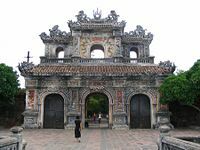 It became the capital of all of Vietnam in 1802, with the rule of Emperor Gia Long. 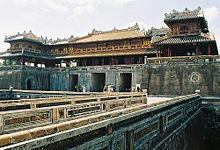 The emperor constructed a new palace and citadel in Hué, the Purple Forbidden City, modeled after China's Forbidden City. Much of the Imperial City had been destroyed during the Vietnam War, although the government of Vietnam and UNESCO have been restoring remains. 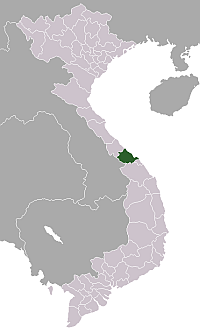 Huế originally rose to prominence as the capital of the Nguyễn Lords, a feudal dynasty which dominated much of southern Vietnam from the seventeenth century to the nineteenth century. In 1775, when captured by Trịnh Sa, it became known as Phú Xuân. In 1802, Nguyễn Phúc Ánh (later Emperor Gia Long) succeeded in establishing his control over the whole of Vietnam, thereby making Huế the national capital. China recognized his rule in 1804. Gia Long confided with geomancers to decide the best place to built a new palace and citadel. After the geomancers had decided on a suitable site in Huế, building began in 1804. The government forced thousands to work constructing a wall and moat, ten kilometers long. Initially the walls had been earthen, but later stone walls, two meters thick replaced those earthen walls. Huế had been the national capital until 1945, when Emperor Bảo Đại abdicated and a Communist government established in Hà Nội (Hanoi), in the north. The rule of the last Vietnamese Emperor ended in the mid-1900s. While Bảo Đại had been briefly proclaimed "Head of State" with the help of the returning French colonialists in 1949, his new capital became Sài Gòn (Saigon) in the south. That rule proved shaky without recognition from the Communists and the full acceptance of the Vietnamese people. During the Vietnam War, Huế's central position placed it close to the border between North Vietnam and South Vietnam. The city fell within the borders of the South. During the Tết Offensive of 1968, during the Battle of Hue, the city suffered considerable damage not only to its physical infrastructure, but also its historical monuments, mostly from American artillery and bombs. The now infamous massacre at Huế, committed by the Communist forces, also marked a tragic era of the city's history. After the war's conclusion, many of the historic features of Huế experienced neglect, being seen by the victorious regime and some other Vietnamese as relics from the feudal past. A change of policy during the end of the twentieth and beginning of the twenty-first centuries has resulted in the restoration of some parts of the historic city. The Imperial City in Huế, called the Citadel, is a walled fortress and palace in the former capital of Vietnam. A wall stands two kilometers by two kilometers, a moat surrounding the walls and the grounds. The Huong River (Perfume River) that flows through Huế provides the water for the moat. The United States bombing campaign, in 1968, in response to a communist takeover of Huế flattened most of the Imperial city. Only a few buildings survived, such as the Thai Hoa Temple, Can Thanh Temple, the Mieu, and Hieu Lam Cac. The government has been restoring and is preserving the buildings that remain. The Imperial City, with a perimeter of almost 2.5 kilometers, sits inside the citadel. Inside the Imperial City the imperial enclosure (called the Purple Forbidden City in Vietnamese, a term that mimics that used by the Chinese for their own forbidden city) stood. The enclosure had been reserved for the Nguyen royal family. Interestingly, the people of Huế gave the same name that the Chinese gave to their palace complex, the Forbidden City. Like its Chinese counterpart, Vietnam's Purple Forbidden City included many palaces, gates and courtyards. Builders oriented the citadel to face the Huong River to the east, different from the Forbidden City in Beijing, which faces south. The Emperor's palace sits on the east side of the citadel, nearest the river. A second set of walls and a second moat had been constructed around the Emperor's palace. Royal architects subsequently added many more palaces and gates and courtyards and gardens. At its height, the Purple Forbidden City had many buildings and hundreds of rooms. It suffered from termite and cyclone damage, but still offered an impressive scene. Many bullet holes left over from the war pockmark the stone walls. Along the Perfume River from Huế, a myriad other monuments lie including the tombs of several emperors such as Minh Manh, Khai Dinh, and Tu Duc. The Thien Mu pagoda, the largest pagoda in Huế and chosen as the official symbol of the city, sits close to the city center along the river. The Hue Museum of Royal Fine Arts on 3 Le Truc Street also maintains a collection of various artifacts from the city. The cuisine of Huế draws from throughout Vietnam, but the prominence of vegetarianism represents one of the most striking differences in cuisine from the rest of Vietnam. Several all-vegetarian restaurants dot the city to serve the locals who have a strong tradition of eating vegetarian twice a month, as part of their Buddhist beliefs. ↑ Mark A. Ashwill and Ngoc Diep Thai, Vietnam Today: A Guide to a Nation at a Crossroads (Yarmouth, ME: Intercultural Press, 2005), 167. ↑ Franklin Ng, The Asian American Encyclopedia (New York: Marshall Cavendish, 1995), 607. ↑ Neil L. Jamieson, Understanding Vietnam (Berkeley: University of California Press, 1995), 10. ↑ Andrew Hardy, Red Hills: Migrants and the State in the Highlands of Vietnam (Honolulu: University of Hawaiʻi Press, 2003), 139. ↑ Basil Guy and Francis Assaf, The King's Crown: Essays on XVIIIth Century Culture and Literature Honoring Basil Guy (Louvain: Peeters, 2005), 153. ↑ M. A. Aldrich, The Search for a Vanishing Beijing: A Guide to China's Capital Through the Ages (Hong Kong: Hong Kong University Press, 2006), 89. Ashwill, Mark A., and Ngoc Diep Thai. 2005. Vietnam Today: A Guide to a Nation at a Crossroads. Yarmouth, ME: Intercultural Press. ISBN 9781931930505. Guy, Basil, and Francis Assaf. 2005. The King's Crown: Essays on XVIIIth Century Culture and Literature Honoring Basil Guy = To tou vasileōs stephanōma. Louvain: Peeters. ISBN 9789042913417. Hardy, Andrew. 2003. Red Hills: Migrants and the State in the Highlands of Vietnam. Honolulu: University of Hawaiʻi Press. ISBN 9780824826376. Hữu Ngọc, and Lady Borton. 2006. Hué̂ Cuisine. Hà Nội: Thé̂ Giới Publishers. OCLC 133847660. Nolan, Keith William. 1983. Battle for Hue: Tet, 1968. Novato, CA: Presidio Press. ISBN 9780891411987. Ng, Franklin. 1995. The Asian American Encyclopedia. New York: Marshall Cavendish. ISBN 9781854356772. Smith, George W. 1999. The Siege at Hue. Boulder, CO: Lynne Rienner. ISBN 9781555878474. This page was last modified on 20 January 2018, at 16:45.